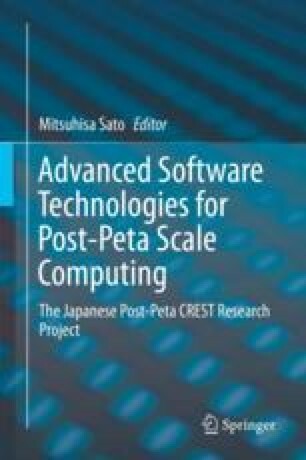 In this project, the software technologies for the post-peta scale computing were explored. More specifically, OS technologies for heterogeneous architectures, lightweight thread, scalable I/O, and fault mitigation were investigated. As for the OS technologies, a new parallel execution model, Partitioned Virtual Address Space (PVAS), for the many-core CPU was proposed. For the heterogeneous architectures, where multi-core CPU and many-core CPU are connected with an I/O bus, an extension of PVAS, Multiple-PVAS, to have a unified virtual address space of multi-core and many-core CPUs was proposed. The proposed PVAS was also enhanced to have multiple processes where process context switch can take place at the user level (named User-Level Process: ULP). As for the scalable I/O, EARTH, optimization techniques for MPI collective I/O, was proposed. Lastly, for the fault mitigation, User Level Fault Mitigation, ULFM was improved to have faster agreement process, and sliding methods to substitute failed nodes with spare nodes was proposed. The funding of this project was ended in 2016; however, many proposed technologies are still being propelled. Sato, M., Fukazawa, G., Shimada, A., Hori, A., Ishikawa, Y., Namiki, M.: Design of multiple pvas on infiniband cluster system consisting of many-core and multi-core. In: Proceedings of the 21st European MPI Users’ Group Meeting, EuroMPI/ASIA ’14, pp. 133:133–133:138. ACM, New York (2014). https://doi.org/10.1145/2642769.2642795.